In this guide, it will walk you through the proccess of downloading, installing and registering your product. You can download your product from your user area on the Accusonus website, here. Then download your chosen product. You can download an installer for any accusonus product from your accusonus account page at https://www.accusonus.com/dashboard#downloads . Each product download consists of a .zip file that contains an executable installer for your operating system of choice. Launching the installer will guide you through the necessary steps to install the product. 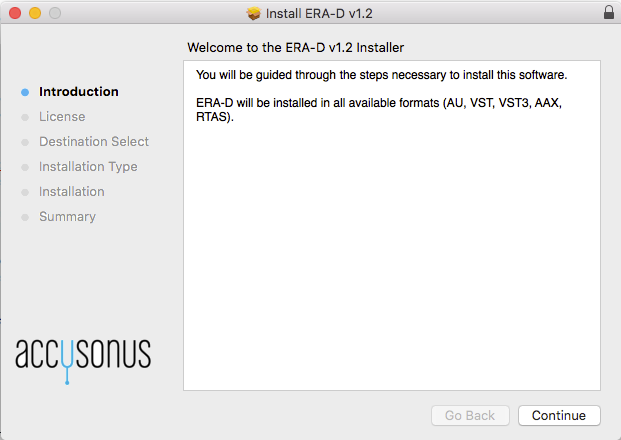 Then simply run the installer! Once you have purchased an accusonus product, you will receive an e-mail with the product key. You will then need to go to the following URL here to register your product. 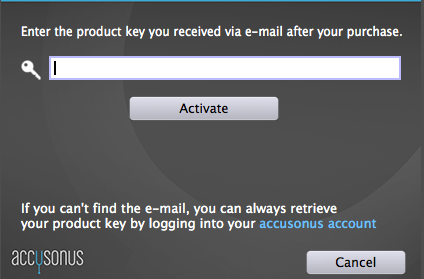 You can also retrieve your product key at any time from the ``Product Keys'' tab of your accusonus account at https://accusonus.com/dashboard#product-keys . You can activate your product by clicking the ``Activate'' button on the evaluation screen. During the trial period you can always bring up the evaluation screen by clicking the ``key'' icon on the accusonus toolbar (see Section 8of this manual for more information on the toolbar). Each product key can be used to activate an accusonus product in up to three different computers . You can track the amount of activations from your accusonus account and the ``Product Keys'' tab. If your computer is connected to the internet, make sure the ``I'm online'' checkbox is checked when you click ``Activate''. Then, you can activate your product with a single click (Fig. 6). Just enter your product key in the text box and click ``Activate''. Step 1 : Enter your product key in the text box and click ``Generate''. A request file will be generated in the folder you selected. Step 2 : Transfer this file to a computer with internet connection (e.g. using a USB stick). 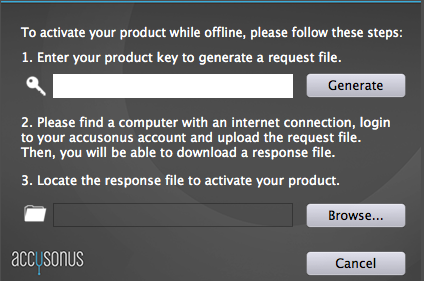 Login to your accusonus account and upload the request file using the ``Offline activation'' tab. Download the response file and transfer it back to the offline computer. Step 3 : Click ``Browse'' to locate and select the response file you downloaded. Note that you don't have to keep your plug-in or DAW open between steps 2 and 3. There are cases when you might want to transfer a product activation from one computer to another. You can do this by deactivating the product in the first computer and activating it on the second computer. 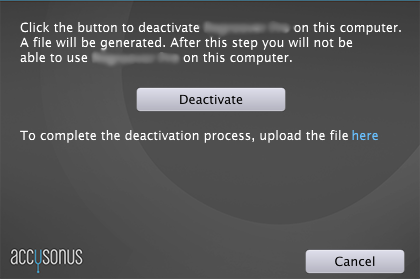 To deactivate your product click the ``key'' icon on the accusonus toolbar to open the deactivation screen (Fig. 8). By clicking ``Deactivate'', a file dialog will appear. Select a folder, where a deactivation file will be generated. Once the file has been generated, the product will be deactivated on the current computer and you cannot use it anymore. You can always activate the product again, if you have enough activations left in your product key. To complete the deactivation process and free up an activation slot, you must upload the deactivation request file to your accusonus account, in the ``Deactivate product'' tab.